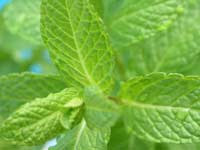 Mint leaves have a pleasant warm, fresh, aromatic, sweet flavor with a cool aftertaste. They are used in various cuisines world over. Mint is not used in cooking but also has medicinal properties. This is my entry to the event “Weekend Herb Blogging(WHB)” started by Kalyn’s Kitchen and hosted by Real Epicurean this week. The following recipe is in honour of the refreshing herb..Mint! Boil the veggies. Grind mint and green chillies with little water in a blender. Heat oil in a pressure cooker. Add cardamom, cloves, cinnamon stick and the bay leaf. Fry till fragrant and then add the sliced onions. Fry till they are soft and transparent. Add the ginger garlic paste and fry for a few minutes. Now add the mint-chilli paste, stir for 2 minutes and then add the boiled veggies. Mix well and add the measured water and close lid. When the steam begins to rise, reduce heat and add the washed strained basmati rice. Add salt and lime juice, mix well and close lid with weight. Cook on low heat for 10 minutes. Mix well before serving. Serve with summer salad with or without yoghurt. Y'day I too posted the same recipe..both mine and your look like almost same. Looks yum,mine is little different. Pudina is my favorite herb, what a flavor it gives! Hi Madhu, I took a peek at yours, my my what similarity :) Has to be since its Pudina! sounds like a very aromatic pulao. my mint plant is growing so I would love making this. Sounds really good. I love mint, but I've never seen it used quite like this before. Hey Namratha I made this today and it came out really good. Hubby loved it. I have posted the pic in my blog. Please have a look.